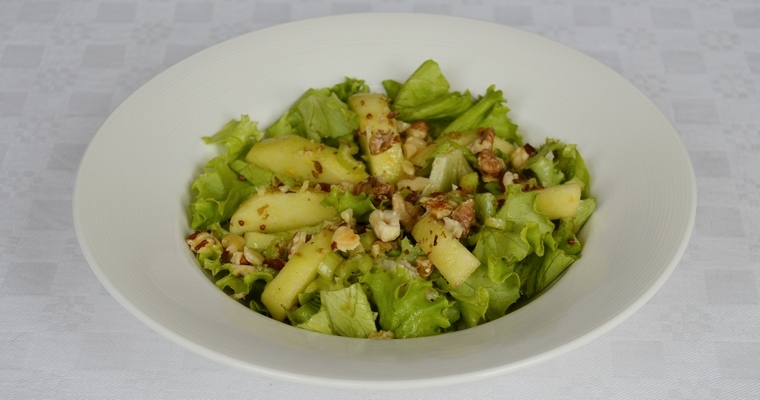 Crisp, refreshing salad made with sweet apples, toasted nuts and a thick and creamy wholegrain mustard and balsamic vinegar dressing. A Dairy-free recipe. This summer salad provides a mix of interesting textures, and a subtle balance of sweet, sour and bitter flavours. You can serve it as a light starter, or turn into a main meal by adding slices of grilled chicken or bacon. For a vegan option, pair with chunky wedges of roasted parsnip. Heat a small, heavy-based frying pan over a medium heat. Add the nuts and dry fry until fragrant and just starting to colour, stirring frequently – about 5-10 minutes. Watch carefully, as they can quickly burn! Remove from the pan and spread over a plate to cool for a few minutes. Bash the hazelnuts until they break apart into largeish pieces – you can use a pestle and mortar to do this, or seal in a bag and bash with a rolling pin. Repeat with the walnuts. Peel the apple (or not – peel can be hard to digest). Chop into wedges or matchsticks (stand the apple upright. Cut down to slice off a side, as close to the core as possible. Turn the apple 90° and repeat until all four sides have been removed from the core. Lay the sides cut-side down and slice lengthways into 1/4 inch – 1/2 inch slices. Stack slices and repeat). Toss immediately in the lemon juice to stop the apple from discolouring. Combine the lettuce, apple and celery in a large bowl. Pour over the salad dressing just before serving. Toss until evenly coated using your hands, then scatter over the nuts.